Perfect Recall. The crebain can recall any detail it has seen in the past 3 days with perfect accuracy. Flock Tactics. When flying in a flock the crebain may attack as a group with a +5 attack bonus, dealing 3 (1d6) piercing damage from multiple strikes. Beak.Melee Weapon Attack: +5 to hit, reach 5 ft., one target. Hit: 1 piercing damage. Speed 20 ft., flying 120 ft. Multiple Attacks. The fell beast may make up to two attacks each turn. Noxious Stench. The fell beast is surrounded by putrid vapors. Any creature within 5 ft. of a fell beast must make a successful DC 10 Constitution saving throw at the beginning of their turn or become poisoned until the beginning of their next turn. Lashing Tail.Unarmed Weapon Attack: +6 to hit, reach 20 ft., two targets. Hit: 14 (2d10 + 4) bludgeoning damage. Talon.Unarmed Weapon Attack: +6 to hit, reach 10 ft., one target. Hit: 14 (2d10 + 4) slashing damage. Bite.Unarmed Weapon Attack: +7 to hit, reach 10 ft., one target. Hit: 23 (3d12 + 4) piercing damage. Despairing Cry (1/day). All creatures within hearing of the cry, which can be heard up to 1 mile away, must make a successful DC 10 Wisdom saving throw or become frightened for 30 minutes. Beating Wings (Recharge 6). The fell beast unfolds and beats its large wings sending a strong blast of wind in a 40 ft. cone. Each creature in the cone must make a successful DC 13 Constitution saving throw or take 8 (2d8) thunder damage and be pushed back 10 ft. and knocked prone. On a successful save they take half damage and are pushed back 5 ft.
Shriek (Recharge 4-6). The fell beast unleashes a psychic attack manifested as an audible shriek upon all creatures in a 60 ft. cone. Each creature in the cone must make a successful DC 16 Wisdom saving throw or take 19 (3d12) psychic damage and become stunned until the end of their next turn. On a successful save they only take half the damage. Multiple Attacks. The fell beast may make up to three attacks each turn. Only one may be Bite. Lashing Tail.Unarmed Weapon Attack: +7 to hit, reach 20 ft., two targets. Hit: 19 (3d10 + 4) bludgeoning damage. Talon.Unarmed Weapon Attack: +7 to hit, reach 10 ft., one target. Hit: 19 (3d10 + 4) slashing damage. Bite.Unarmed Weapon Attack: +8 to hit, reach 10 ft., one target. Hit: 28 (4d12 + 4) piercing damage. Despairing Cry (1/day). All creatures within hearing of the cry, which can be heard up to 1 mile away, must make a successful DC 14 Wisdom saving throw or become frightened for 30 minutes. Beating Wings (Recharge 6). The fell beast unfolds and beats its large wings sending a strong blast of wind in a 40 ft. cone. Each creature in the cone must make a successful DC 15 Constitution saving throw or take 12 (3d8) thunder damage and be pushed back 10 ft. and knocked prone. On a successful save they take half damage and are pushed back 5 ft.
Shriek (Recharge 4-6). The fell beast unleashes a psychic attack manifested as an audible shriek upon all creatures in a 60 ft. cone. Each creature in the cone must make a successful DC 18 Wisdom saving throw or take 26 (4d12) psychic damage and become stunned until the end of their next turn. On a successful save they only take half the damage. Speed 15 ft., flying 60 ft.
Observant. +3 Perception with a range of 20 miles in clear conditions. Fleet. When flying, the great eagle may take an additional move action on other creature's turn or on its own turn. Beak.Melee Weapon Attack: +7 to hit, reach 5 ft., one target. Hit: 10 (2d8 + 2) piercing damage. Talon.Melee Attack: +7 to hit, reach 10 ft., two targets. Hit: 12 (2d10 + 2) slashing damage. Bite.Melee Weapon Attack: +5 to hit, reach 5 ft., one target. Hit: 5 (1d8 + 1) piercing damage, and the target must make a DC 10 Constitution saving throw or become poisoned for their next 2 (1d4) turns. Eight-legged Grapple.Melee Attack: +5 versus target's Dexterity (Acrobatics) or Strength (Athletics) roll. Hit: target is grappled, and the Mirkwood spider may use the Bite or Web attacks on the target with no penalty. Web.Ranged Weapon Attack: +3 to hit, range 20 ft./40 ft., one target. Hit: Target is restrained by a web with 3 hit points. After using this attack 3 times the Mirkwood spider cannot use it again until completing a short rest. Tall Mount. A rider on the oliphaunt is at 10 ft. range from adjacent squares due to the height of the oliphaunt. Rampage. A rider must make a DC 15 Wisdom (Animal Handling) check to control the oliphaunt. On a failed check the oliphaunt may ignore the rider; if the check fails during combat the oliphaunt rampages by running in a random direction, trampling anything in it's path, and throwing the rider. A thrown rider must make a successful DC 10 Dexterity (Acrobatics) check or take 1d6 bludgeoning damage from the fall. Fearsome. When an enemy enters combat with an oliphaunt, each enemy must make a DC 10 Wisdom saving throw or become frightened by the oliphaunt. Multiple Attacks. The oliphaunt may attack up to two targets with trample and another target with tusks or trunk in the same turn. Tusk Gore.Melee Weapon Attack: +9 to hit, reach 5 ft., one target. Hit: 12 (2d6 + 6) piercing damage. Trunk Shove.Melee Weapon Attack: reach 10 ft. one target, +9 versus target's Strength (Athletics) or Dexterity (Acrobatics). Hit: target is knocked prone and stunned for their next turn. Trample.Melee Weapon Attack: +9 to hit, reach 5ft., two targets. Hit: 15 (3d6 + 6) bludgeoning damage. Keen Hearing and Smell. 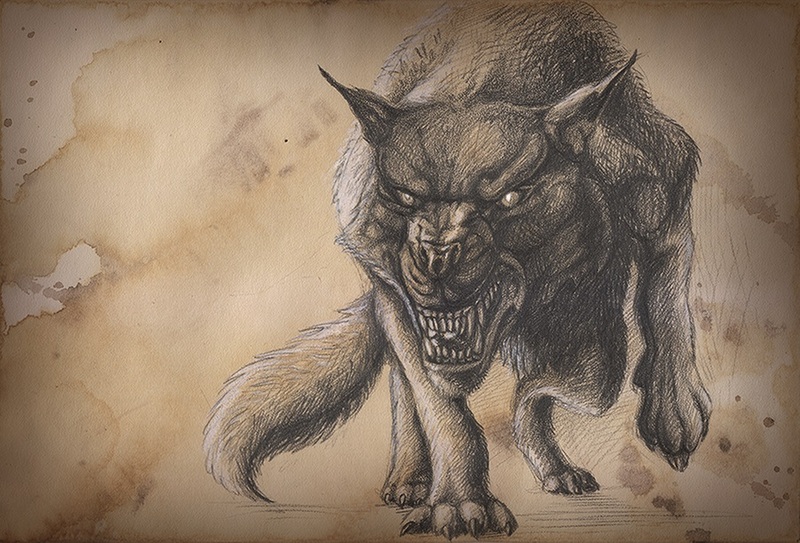 The warg has advantage on Wisdom (Perception) and Wisdom (Survival) checks that rely on hearing or smell. Pack Tactics. The warg has advantage on attack rolls if at least one of the wolf's allies are within 5 feet of the target and the ally is not incapacitated. Bite.Melee Weapon Attack: +6 to hit, reach 5 ft., one target. Hit: 10 (2d6 + 3) piercing damage and target must make a DC 13 Strength saving throw or be knocked prone.